If a group of masked men burst into a bank demanding “Hand over the cash!” that’s robbery. If someone brazenly takes items off a supermarket shelf, stuffs them in the pockets of their overcoat and runs out without paying, that’s theft. So, why has it become acceptable for children and teenagers to knock on our front doors and demand free sweets and other goodies every 31st of October? In fact, it’s more than acceptable. It’s actively encouraged by some parents who spend money on Halloween-related items which on November 1st either get stored in the attic for a year or thrown out. Supermarkets are full of Halloween costumes and horror masks with bloody axes through heads and eyeballs popping out – not forgetting those grinning ‘killer clowns’. Unbelievably, more than £300 million was spent on such Halloween tat last year by British parents who probably regard Halloween as ‘just a bit of fun’. But in these times of appalling terrorist attacks, where’s the ‘fun’ in children running around wielding ‘blood-soaked’ plastic knives and meat cleavers? If you think manufacturers and retailers only supply what the public demand, were you aware that several Halloween websites have been advertising ‘Anne Frank’ costumes? Even if some people had ‘demanded’ it, what responsible company would want to make money from a costume representing a young girl who died in the Holocaust? The website channel Mums found that two thirds of parents would back a strict age rating on Halloween costumes; a further three quarters would like supermarkets to take ownership of the outfits they sell; and 55 percent of parents felt children’s costumes are too sexualised. We’ve travelled a long way down the bumpy road to ‘Bad Taste City’ since the harmless apple-bobbing of Halloween’s past. Will someone press the bell for me please? I want to get off at the next stop . . .
Getting ready for winter – but was there even a summer? I’m in need of some help here. My gran would always tell me to “never cast a clout until May is out” and to be honest, for most of my childhood, I never knew what on earth she was talking about. Apparently, since the 15th century ‘clout’ is a word that has been used to describe a fragment of cloth or clothing and could be spelled as clowt, clowte, cloot, or clute. It’s here that the saying took on two meanings, rather than just the one original. The new meaning was a reminder not to be too quick to chuck the winter clothes before cooler days during the month of May were most likely over. Following events of the weekend and the wrath of Hurricane Ophelia and Storm Brian, I am now wondering when would be the best time to pull out the Damart catalogue (other thermal underwear retailers are available) and put my vest back on. Putting the patio furniture and barbeque away for the winter this week left me feeling rather chilly to say the least. The highlight of last week was performing my show in a very beautiful part of Wales. 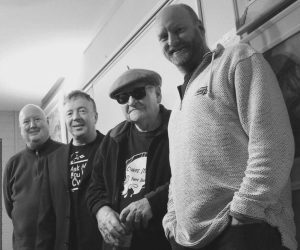 My chums, Gary Slaymaker, Aled Richards and the legend that is Meic Stevens took on a very appreciative audience at the Felinfach Theatre near Lampeter. This wasn’t my first time at the venue and I’ve yet to meet such a well organised, welcoming and supportive team of people. The bigger and more popular venues scattered around the country could learn so much from the people behind this gem of a theatre. It’s safe to say that venues and live entertainment are faced with challenges, hefty competition and the creative marketing needed to prise people away from their TV sets and back to support live entertainment within their communities. Local authorities need to do more; local businesses should embrace the opportunity and get involved. Supporting the performing arts and keeping venues alive plays an important part in bringing people together, thereby helping communities to thrive. This is key to maintaining our culture and something that has sadly dwindled in the past decade. We can all make a difference, if we take action and get involved. Don’t let apathy win and kill off talent and our culture. What image pops into your head when you hear those words? A raggle-taggle group of whey-faced, shoeless Victorian children, holding out wooden bowls? Or the Great Depression of the 1930s when long lines of undernourished men and women in threadbare clothes, waited in the freezing cold for a free hot meal? Soup kitchens are consigned to history, along with rickets, scurvy and Betamax videos. Right? Wrong! In poor, inner-city areas they’ve never gone away. Due to recent events, including the financial crisis of 2007/8, they’ve spread . . . even to Llanelli. Every Sunday evening, the Sosban Soup Kitchen in Old Castle Road supplies poor, hungry people with a free hot meal. Run by Gary Glenister and his team of volunteers, it relies on soup and bread generously donated by local companies and people in the community. If I wore a hat, I’d take it off to all of them. But here’s what I can’t get my head around. On the one hand, we have soup kitchens providing free food for people in dire financial need. On the other, it seems every week a new restaurant, ice-cream parlour or burger joint opens in Swansea. Walk down any street and you’ll soon see we have a massive obesity epidemic. Yes, I realise some unfortunate people are the size of Lundy due to a medical condition, but most people become obese because they love food, have dozens of eateries to choose from and, crucially, have the disposable income to spend in them. Whether they’re familiar with the words ‘will power’ is not for me to ask. So, I won’t. But, in between scoffing pizza and burgers, wouldn’t it be great if every one of them occasionally donated a tin of soup to the Sosban Soup Kitchen? And, whatever the size of your waistline, maybe you could too . . . If you doubt Las Vegas is the ‘Entertainment Capital Of The World’, just consider who’s performing there this month . . .
Celine Dion; Elton John; Creedence Clearwater’s John Fogerty; Jennifer Lopez; Billy Idol; Ringo Starr’s All-Starr Band; Britney Spear . . . AND Hollywood comedians Steve Martin and Martin Short. If any of them came to Swansea for a one-off show, tickets would sell out in minutes. Vegas boasts big star names all year round and ticket prices and audience expectations are always high. So, it must have been a challenge for Vegas entertainers, especially the comedians, to go out on stage the night after the terrible event that unfolded in the shadow of the Mandalay Bay Hotel. Despite the tragedy, visitors who’d pre-booked their seats months before would have turned-up expecting to be entertained, if only to try and forget what had happened for a couple of hours. The performers, being true pros, would have risen to the occasion, I’m sure. But there must have been the odd difficult, emotional moment and the comedians would have checked their material for any potentially controversial lines prior to going on. There’s an equation that suggests “Tragedy + Time = Comedy”. Today, the joke “Apart from that, Mrs. Lincoln, what did you think of the play?” is acceptable because President Lincoln died 150 years ago and hardly anyone who was around then is alive today. However, although President Kennedy was shot more than 50 years ago, we’d shudder if a comedian cracked a joke about his assassination. The deaths of two Presidents and what happened in Las Vegas on October 1st span more than a century but have a common denominator – guns. If America insists on keeping the Second Amendment – The Right To Bear Arms – perhaps the equation should be re-written as… “Tragedy + Time = More Tragedy”. There are two possible queues in the supermarket . . .
Why is it the one you decide to go for is always the slowest to move? There is always that one customer in it who has picked the only product in the whole store with no price on. Or the checkout operator decides to plonk the ‘checkout closed’ sign right before your shopping pile. Does this only happen to me? It’s the same at the cashpoint. I always end up standing behind the person who decides now would be a good time to print out and check a monthly statement, check the balance on all four of their accounts and then print out receipts for each transaction! Then there is that fleeting thought that goes through your mind . . . shall I change queues? You battle with this little voice inside your head telling you “NO!” as you know that, as soon as you move, your original queue will move at the speed of light! So you move queues anyway, despite the little voice and Yes, your original queue starts moving quicker than Usain Bolt off the starting blocks . . . Please tell me this doesn’t only happen to me? Not everyone gets to down tools at 4pm. I was on holiday at the time, so missed ‘National Finish At 4pm Day’ – Friday September 15th. I had no idea it existed until I read it in one of the 14 newspapers my ‘paper boy delivered every morning I was away, even though I definitely told my newsagent I was going to Turkey for a fortnight. I remember because he said, “This time of the year it’s lovely in Torquay”. Maybe I should have added “. . . . so while I’m away I won’t need a newspaper delivered because I can buy one in Torquay every day,” but, silly me, I didn’t. So, it was my fault. Unbelievably, “National Finish At 4pm Day” – a blatant message to the nation to do less work – was thought up by a well-known energy drink company. Obviously, it wasn’t Irony Brew! I won’t name it, but think Scarlet Cow and then work it out yourself. The company said, “It’s not about slacking off. It’s about being more productive.” Really? Then why didn’t you call it “National Do An Extra Hour’s Work Day”? The company mistakenly assumed everyone works in an office so if they left work early it wouldn’t create too many problems. But when those people descended on pubs mid-afternoon looking for refreshment, what would they have done if the bar staff had also finished at 4pm? Treble scowls and hissy fits all round! And how would they have got home by bus, taxi or train if all the drivers and conductors and ticket sellers had nipped off early? As for surgeons, they can’t suddenly down scalpels and leave their patients mid-operation when they feel like it. I suggest the energy drink company organise their own “National Think Things Through Properly Day” before they come up with any more silly schemes. On Sunday I found myself doing something a bit different, attending a netball match at Llanelli Leisure centre to support a family friend. Now, I don’t know much about netball, to be honest. But what I discovered was a fantastic bunch of ladies, of all ages and abilities, taking part in a very competitive and sometimes quite dangerous sport. The team work and training which must go into preparation of these matches must be quite intense, as they worked together to produce a thrilling afternoon of sport. Even though the rain and wind outside was miserable, the atmosphere inside was electric. Supporters cheered on their teams and great fun was had by players and supporters alike. The leisure centre was packed. It was plain to see that teamwork and training had paid off for all the ladies involved. Thanks for the invitation, Iona Melrose, and well done to everyone who took part, I’m even thinking of looking for a netball evening class and dusting off my gym kit, so watch this space . . .